Logs End has been a long-standing and proud supporter of the Children’s Hospital of Eastern Ontario (CHEO). This year, our team was thrilled to help supply some of the rustic wood elements for the 2017 CHEO Dream Home, called the “Red Maple”. The following is an article written by Paula McCooey and published in the Ottawa Citizen, along with the photo by Jean Levac from Postmedia News. CHEO’s 27th annual Dream of a Lifetime lottery launched Tuesday, with a luxury Dream Home centrepiece — designed and decorated as an ode to Canada’s sesquicentennial — and nearly $3 million in other prizes available. 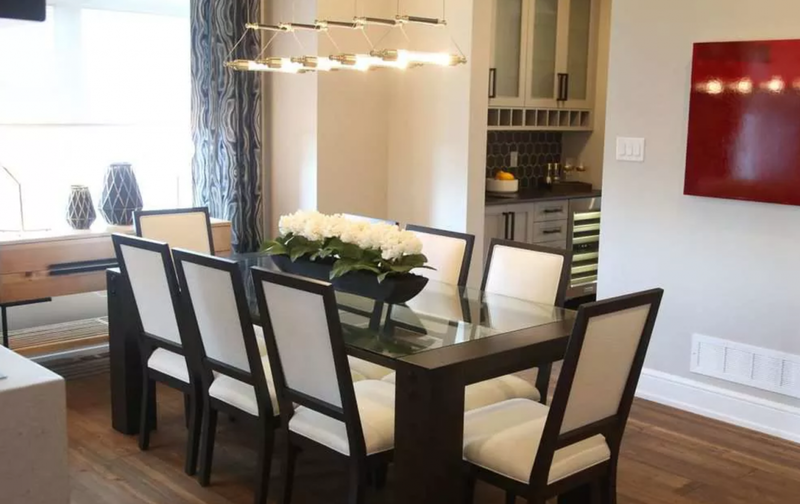 The 5,392-square-foot home on 585 Chriscraft Way in Manotick opened its doors to the media and stakeholders involved in designing, building and furnishing the house, which is the lottery’s grand prize. First prize also comes with $100,000 cash, a 2018 Toyota Tacoma 4×4 pickup truck, a $5,000 Farm Boy gift certificate, and moving, legal and cleaning services, with a total value of around $1.8 million. This year’s model, the Red Maple, is warm and inviting with contemporary and classic Canadian features that include rustic stone, Douglas Fir beams and wood floors milled from reclaimed Logs End Inc. logs pulled from the Ottawa River. There are four bedrooms in the home, including one that is designed as a den/office. The house also sports other high-end amenities, such as a gourmet kitchen, soaring ceilings in the great room, an outdoor fireplace, a two-storey kid’s bedroom, and a fully loaded recreation room with a gym in the basement. A total of 70,500 tickets are available, with 1 in 14 odds of winning one of the 5,100 prizes that have a total value of $2,894,311.87. Prizes include vacations, power boats and cars, as well tickets to the Grey Cup and the Ottawa Redblacks’ last 2017 regular season game for those who purchase before Sept. 22. Also, 50/50 tickets will be sold. Last year’s winner took home $539,657. Since the lottery’s inception in 1991, it has generated more than $40 million for the CHEO Foundation. Last year, it raised $3.3 million, which funds state-of-the-art equipment, research and support services for the hospital. Kevin Keohane, the president and CEO of the CHEO Foundation, said the lottery grows every year because the community has a vested interest in the hospital’s success. Young Wyatt Scott, who suffers from a rare disease that affects his ability to open his mouth or swallow, is the reason so many people get behind the lottery. His mother, who spoke at the launch on Tuesday, doubts her son would be alive if it were not for the care he received at CHEO. “He has a rare condition called brain stem dysgenesis and there are only 15 cases right now in the world,” said Amy Miville. A newly renovated day surgery unit will be complete in late December. The refurbished unit will cut surgery wait times in half for patients. Also, staff will be able to perform an extra 1,500 surgeries a year. The lottery funds numerous research projects in the lab and clinics. The funds are often quadrupled by other funding bodies that match the money raised. CHEO amalgamated with the Ottawa Children’s Treatment Centre this year. This partnership expands services for children with multiple physical, developmental and associated behavioural needs who require specialized care.